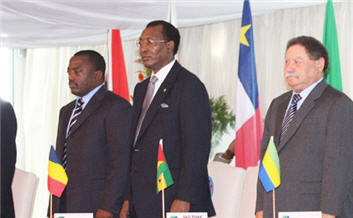 Six Heads of States attended the summit, Théodoro Obiang Nguema Mbasogo of Equatorial Guinea, Denis Sassou Nguesso of the Republic of Congo, Idriss Deby Itno of Chad, Fradique Melo de Menezes of São Tomé and Príncipe, François Bozize of the Central African Republic, Ali Bongo Ondimba of Gabon and Joseph Kabila of the Democratic Republic of Congo. They were joined by Prime Minister Philémon Yang of Cameroon, 2nd Vice-President Gabriel Ntisezerana of Burundi and Foreign Minister Assuncao Afonso de Sousa Dos Anjos of Angola. The summit focused on issues related to regional integration, peace and security, the environment, health and infrastructure. On climate change, the Conference of Heads of States and Governments pledged to deploy all efforts to reverse the gradual disappearance of Lake Chad. Shifting climate patterns and increased demand on the lake’s water from the local population have caused it to shrink considerably over the past 40 years. The Conference also noted progress towards the building of a bridge between Kinshasa and Brazzaville. The controversial project has been opposed in the DRC by Members of Parliament from the Bas-Congo Province who fear the bridge would favor the Port of Pointe-Noire in the Republic of Congo over the Port of Matadi in the DRC as the main entry point for goods in the region. President Idriss Deby Itno was named new Chairman of CEEAC (also known as ECCAS), replacing President Joseph Kabila. The next summit will be held in 2010 in Djamena, Chad.